1,000 km (620 miles) of 62% of all US and Canadian Manufacturing SitesAIDA-America has a 160,000 ft² (14,864 sq m²) facility, located in Dayton, OH on 49 acres (198,296 sq m²) which includes a recent 17,600 ft² (1635 sq m²) welding and fabrication shop addition. Our location puts us within 620 miles (1,000 km) of 62% of all US and Canadian manufacturing sites. 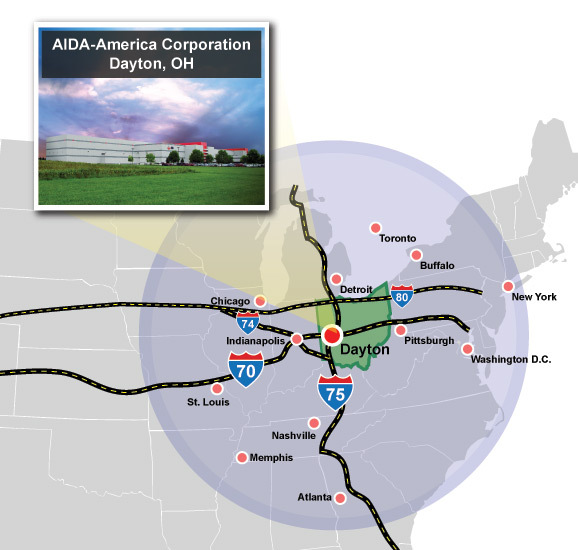 AIDA-America is conveniently located with easy access to I-70 and I-75 as well as major waterways and the Great Lakes.